When the first issue of this new series based off of Gareth Evans’ popular film series begins, mobster Uco is being given early release. And while he’s happy about this, he’s curious why Yuda isn’t being released alongside him. Who’s Yuda? Jakarta’s top cop Rama, using that name as an alias while he’s behind bars. From here we leave the prison and head to the Anaconda Club in Jakarta. People are dancing, taking pills and screwing around when some heavily armed cops in riot gear show up, led by Teja, a ‘special tactics officer.’ They’re there to take in Bejo, a crime boss, but they don’t realize that he’s got a small army of thugs backing him up – the kind of bad guys that are ‘not to be fucked with.’ One of Bejo’s primary hitmen is known simply as The Assassin. The other two? 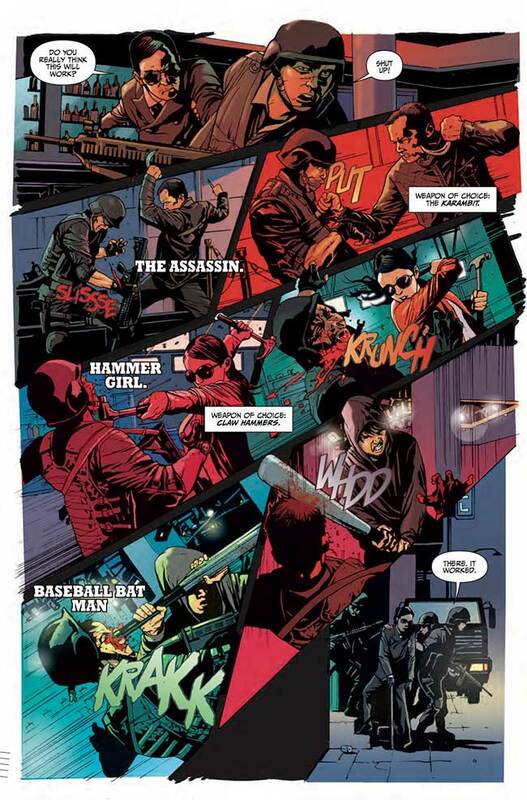 Baseball Bat Man and Hammer Girl. The three prove far faster and deadlier than the cops sent to take in their employer and things get bloody fast, but they’re outnumbered and Teja manages to bring Bejo in to the station to be booked, much to the dismay of his commanding officer who is none too pleased that he ran an unauthorized operation and brought Beja in without enough evidence to really do anything with him. 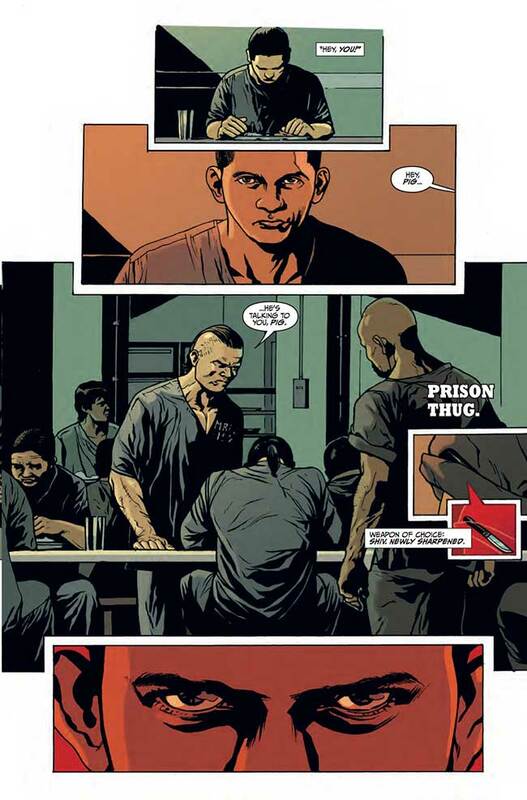 Teja winds up in a prison near Jakarta, behind bars with the types of criminals he’s spent his career trying to bring to justice. He pissed off the wrong people, we’re told. When he’s recognized in the cafeteria he beats the crap out of an inmate before he can open his mouth but it’s too late. 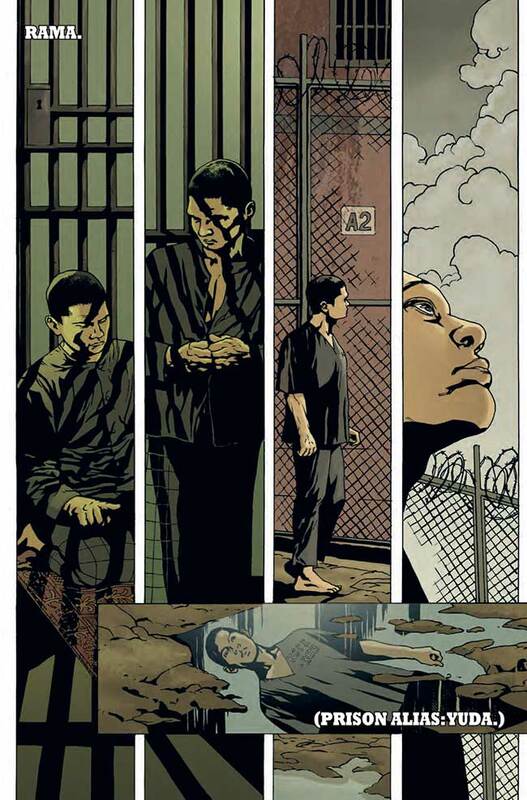 Once the other inmates realize Teja is a cop, his life behind bars is in constant turmoil. 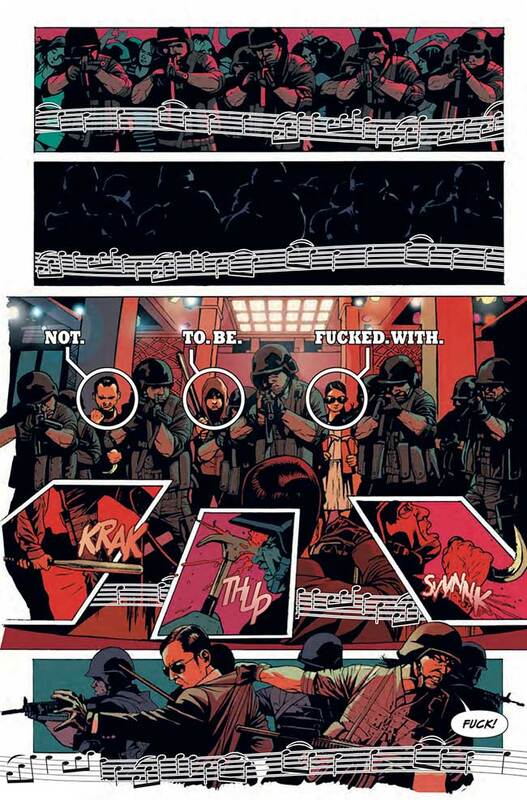 This is a seriously intense first issue! 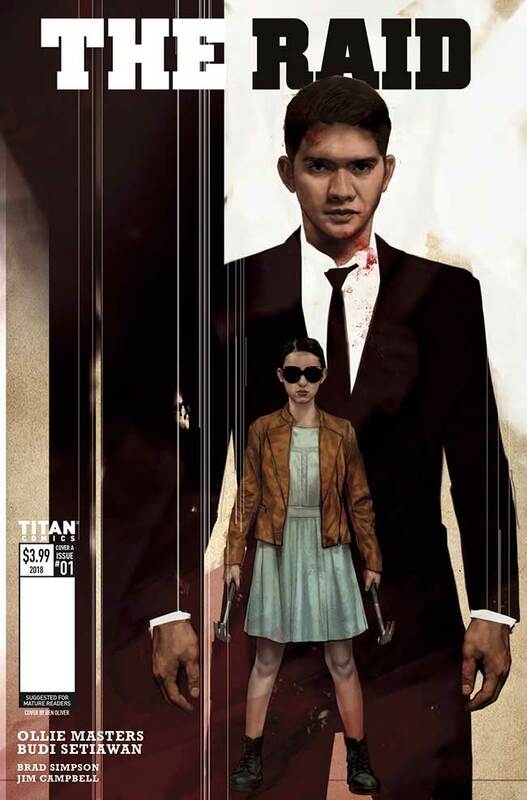 Bringing the type of action that Evans managed to portray so vividly and violently in the two The Raid films to life in comic book form couldn’t have been easy but Ollie Masters and Budi Setiawan are off to an excellent start with this first issue. The story is a strong one, tying into the film’s really nicely and keeping things very much in the same vein, even bringing some of the more memorable supporting players into view – which is a nice touch. It also expands on the films a bit too, which makes it interesting to read. There isn’t a ton of dialogue here, many of the characters are the strong silent type – or smart enough to keep their mouths shut in certain situations – but the plot moves at a very quick pace and not a frame is wasted. The artwork from Budi Setiawan matches the writing really well. There’s a lot of great detail here and man oh man can this guy draw action scenes perfectly. 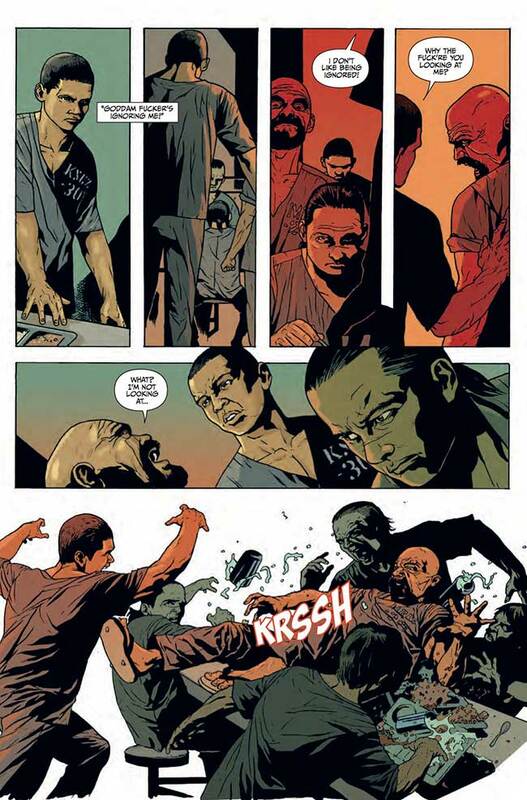 The coloring work from Brad Simpson accentuates all of this, bringing the right amount of darkness into the prison cells, making sure the reds pop the way they should when blood is spilt. Even the lettering from Jim Campbell just works – it’s clean, clear and has a nice cinematic feel to it at times. The visuals really come together in a big way to make this work. 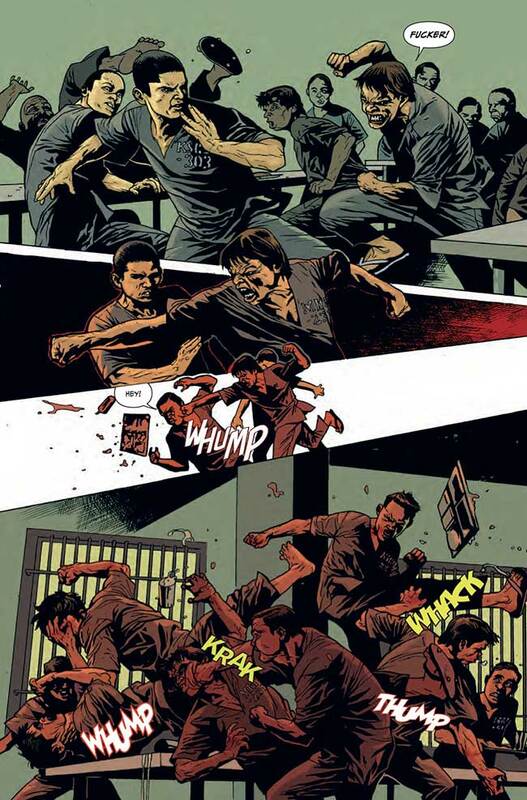 If you were a fan of the films that inspired this, don’t miss the first issue of The Raid – it’s a remarkably strong debut that leaves us wanting the next issue as soon as possible!